Pat Weis is "The Architect of the Texas Longhorn Women's Golf Team"
"A good team can't have a whole bunch of leaders." After coming close to winning two national championships she says "Winning simply cannot be your only goal. One team and only one team wins.."
Unlike Texas Basketball, Football, Track And Baseball There Are Very Few Books dedicated to Longhorn golf. I Hope With Time This Site Can Add Some Historical Insight And Tell the compelling Story Of Longhorn Golf . Pat Weis was hired in 1957 as a P.E. teacher. After Title IX in 1973 she was hired as the varsity golf coach. changes of a sports program dominated by men to a sports program dominated by great women and men athletes. Harvey Penick was one of the first golf instructors who understood that talent is not gender exclusive. Much of the research for this section was derived from the incredibly informative book -"Life of Coach-The Story of Pat Weis" by Mickie Edwards. 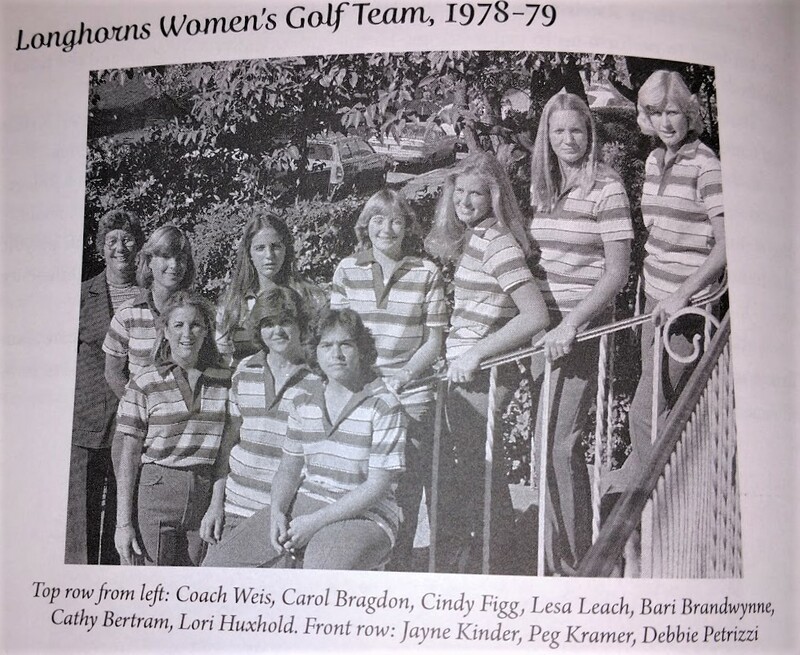 The UT women's golf program started in 1969. She earned 5 Conference Coach of the Year Awards, 2 National Coach of the Year Awards, and one Gladys Palmer Award. Nancy Hager was the medalist in the state meet, and finished 3rd at the National meet. First year for the Women's Intercollegiate Athletic Program. The budget for all 7 women sports was $27,000. Women's golf received $220 of the budget. Coach Weis managed the Golf team in her spare time and worked full time as a teacher. With no budget to travel she decided to bring top level women's golf to Austin. By 1976 the name of the invitational tournament is named after Betsy Rawls. Pat was on the 1973 and 1974 AIAW Golf Committee. Coach Weis thought Cindy Figg was a great leader on the team. Lopiano is hired as the Women's Athletic Director. The golf team decides not join the SWC. Since the budget is very small there are no uniforms until a Austin doctor contributes funds to purchase the clothing. Cathy Bertram remembered how hard it was to find burnt orange accessories for the team and that Coach Weis had to wash all the Longhorn clothes. 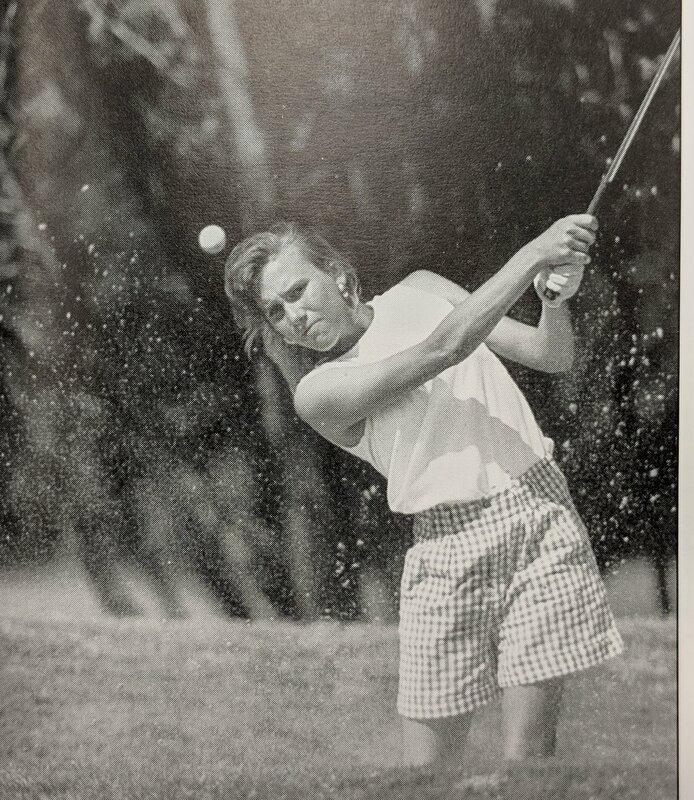 Nancy Hager finishs 5th in the AIAW individual rankings in 1975, and she is the medalist at the Betsy Rawls' Invitational in 1974 and 1975. She is MVP on the team in 1974. Below is the first official Longhorn golf team at Texas. Horns Up!!!!!!!!!!! Harvey Penick helps Cindy Lincoln develop into an All American. Most valuable player is Carla Spenkoch. Team finishes 2nd in state. Laura Huxhold is the medalist for the Championship team in 1977. Team is 8th in the AIAW National championship tournament. For the first time, On May 8th 1977 the tower is orange for a woman's SWC championship. Golf team is 3rd in the AIAW National championship tournament. The team is 14th in the AIAW National championship. Coach is still a part-time coach of the Longhorn women's golf team, but the budgets start to increase so the Longhorns offer more golf scholarships. Debbie Petrizzi finishs as #1 AIAW National Championship medalist in 1978. She is an All American, HOH inductee, and the Honda Broderik Award winner for National Collegiate Golfer of the year. She is one of only three Horns that have won the individual title at the National Championship tournament. Bari Brandwynn's is the daughter of a band leader at Ceaser's in Vegas who has two celebrity friends - Mac Davis and Don Cherry. They tell Coach Weis how great a golfer Bari is but since the recruiting rules in 1978 stated that a university could not recruit a women athlete or pay her way on a recruiting trip, Bari drives herself and her two dogs to Austin for the interview with Coach Weis. She signs a Letter of Intent. Coach Weis is selected chairperson for the All-American selection committee. Lori Huxhold is a stand out player on the 1979 team. Jackie Daiss is the only girl player on the boy's high school team. Her golf talents are featured in Sports Illustrated. Coach Weiss is hired as a full time coach for the Women's golf team, and the Athletic Department pays her full salary. Slow start but an nice finish as the Horns won the TAIAW state championship with Lori Huxhold winning the medalist honors. The team is 7th in the AIAW National championship. First time that Coach Weis split her golf team up sending one team to California and the other to Bryan Tx. Experience was needed for all the golfers had great potential. This was one of Coach Weis best teams with Pettrizzi, Figg, and Brandywynne leading the way. Team is 3rd in the AIAW National championship. Nancy Ledbetter finishsd 5th in the AIAW individual rankings. Coach Weis says to those who would listen that it is difficult for Freshman to adjust from golf as an individual sport in high school to golf as a team sport in college. This is Texas first year to play under NCAA rules. In order to give student athletes a chance to enjoy the college environment, the NCAA limits practice time to 20 hours a week. Golf scholarships are cut from 8 to 6 by the NCAA. The team is victorious in three tournaments and places 15th in the NCAA Championship. Kim Shipman says of Coach Weis "Being able to coach and organize all kinds of personalities takes a big heart, a quick wit, and aged Scotch." Lisa States that Coach Weis benched her before the team went to San Diego for a tournament. It was Lisa's hometown and her parents still lived there. She was furious, and resorted to begging to perhaps get Coach to change her mind. Lisa learned that Coach never messed around ,and Like many other "incorrigible" players she learned that in order to play at tournaments you had to earn the spot. Team wins one tournament and the SWC Championship. Nancy Ledbetter is the SWC individual championship and she is the MVP of the team. Sue Ginter is 1984 Conference Player of the Year and MVP in 1985. Kate Golden finishs tied for 9th in the NCAA individual rankings in 1989. Her father Joe Bob Golden was on the Longhorn men's golf team in 1951. Sherri Steinhauer is a first team All American, and finishs 42nd in the NCAA Championship. 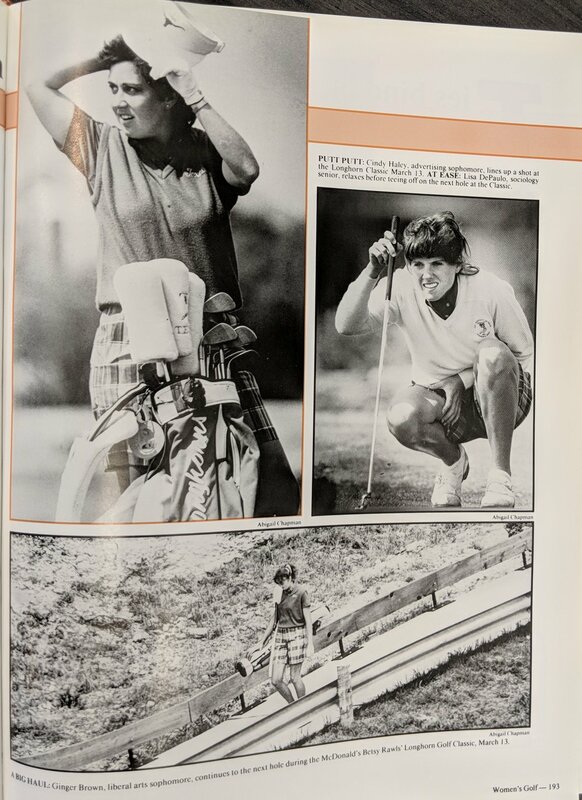 Sherri is quoted as saying in the book Life of Coach by Mickie Edwards that "Coach Weis didn't try to instruct her players about how to play golf. She never worked with us on swing specifics. She would give us tips and goals to strive for , but she left the golfing mechanics up to our own pros." The Betsy Rawls tournament is renamed the "McDonald's Betsy Rawls Longhorn Classic." Jenny Germs from Johannesburg is the first foreign player to receive a Longhorn Golf Scholarship. Kate Golden is SWC individual Championship three times while at Texas. Team wins two tournaments including the SWC championship. Jaime Fischer won the SWC individual title in 1991 and was named Academic All-American. After leaving the tour she became a master instructor and Golf for Women Magazine named her as one of the top 50 instructors. Jaime was always amazed at Coach Weis ability to "assemble a group of young women who each needed so many different things. "Coach worked with a most diverse group of women, always fair, honest, and genuine"- but tough. The Golf team wins six tournaments including the SWC championship. Team places 7th in the NCAA Championship. The Longhorns successfully recruit their first US Amateur Champion- Michiko Hattori. Coach Weis changs her practice schedule to allow more focus on individual play vs. team play. The new approach is successful and team morale boosted. Finally, after 13 years the Longhorns win their host tournament. Coach Weis says this was one of her best teams. She is named National Coach of the Year by the National Golf Coaches Association. Horns broke a SWC record for widest victory margin. Hattori was the medalist. She won 5 of the teams tournaments. Coach Weis record at Texas is impressive. As of 1988 her golf teams had qualified for the National Championship venue in all but two years. Piper Wagner- 1987-1982 "Piper UP"
Piper says in the book Life of Coach by Mickie Edwards that at a certain moment and time " I wasn't a very good golfer." Other teammates "were tough and seemed able to take the ups and downs of competing withe each other and other team as well." "My biggest challenge was growing up mentally and fitting in. I had to learn how to handle life. For me, the pressure was so intense." Piper accomplish her college goals. In March 2011 she was diagnosed with cancer. Her teammates and friends started a "Piper UP" charity bike ride to honor Piper. 15,000 white wristbands were sold to help Piper and raise awareness of Lung cancer. Piper passed away in August of 2014, but she left a great Legacy and in 2014 her Longhorn friends dedicated the 2014 Weis cup to Piper. Horns are champions of the SWC and is the number one qualifier for the NCAA tournament. After the first day the team is 19 shots down, and they never recover. The team finishs 10th. Coach Weis is asked why some of her players lacked discipline? She said "Advanced athletic skill does not automatically come with the responsibility of maturity!" Jaime Fischer is the SWC individual title winner and a Academic All-American. After leaving the tour she coaches as a master instructor. Golf for Women Magazine named her as one of the top 50 instructors. Women’s golfing team wins their 4th consecutive SWC. Michiko Hattori tied for 2nd in the SWC. Team is victorious in two tournaments including the SWC championship. Machiko is SWC player of the year. Tom Kite's connections helped the Longhorns recruit Machiko. Coach Weis said that Michiko was " one of her best athletes at managing her game. Michiko Hattori finishs 2nd in the NCAA National Championship medalist competition and she wins the Honda Broderik Award for National Collegiate Golfer of the year. In 1989 she receives the Eleanor Dudley Award. She also finishs tied for 7th in 1988 and ties for 6th place in 1991 in the NCAA Individual rankings. Machiko holds the Texas record as most times to make the All American team (4). 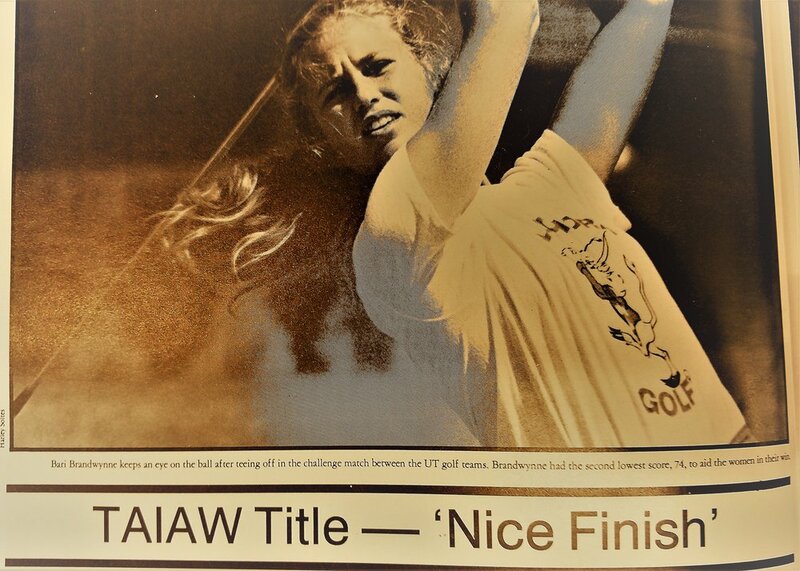 She was also named SWC Athlete of the decade for golf ( 1982-1992). Jenny Turner is the highest finisher from the state of Texas at the NCAA tournament. She finished 2nd at the SWC meet. Team is victorious in five tournaments including the SWC championship. 1993-Coach Weis 4th in the Nation. After 20 years as head coach of the Longhorn women’s golf team , Pat Weis retires. Nadine Cash Angela Wray, an d Jenny Turner made sure that Pat’s last year was a success with a 4th place finish at nationals. Ash was the SWC player of the year and Weis was Coach of the Years. Team wins the SWC Championship. After a player begs Coach Weis to play her in a tournament, Coach says "Let your clubs do the talking, not your mouth!". Charlotta Sorenstam finishes as #1 NCAA National Championship medalist in 1993, and wins the Honda Broderik Award for National Collegiate Golfer of the year. She also finishes #1 in the NCAA individual rankings in 1993, and is a first team All American. Nicole Cooper walks-on to make the UT women's golf team. With special instruction from Harvey Penick she develops into a consummate golfer. She and Nadine Cash represent the USA in the World University Golf Championship in Madrid, Spain. Nicole took individual honors and the USA wins as a team. Her final two holes of the match were a pressure cooker but a comment from Harvey helped smooth her nerves. He said to her before she left for the tournament " take dead aim". She did!!!! Coach Weis continued the history of great coaches at Texas. While she never produced a NCAA champion she was within 2 strokes of winning it all on two separate occassions. Her teams won 7 of the 10 SWC championships during her tenure. More importantly 93% of her eligible players graduated. To read more about UT women's Golf program and Pat Weis there is a great book available. Before Susan played golf she was a Tennis professional for 13 years but injuries forced her to quit the game. Looking for a new sport she visited Havery Penick in 1978 and he instructed her to greatness in golf. In 1993 she was hired as Head Coach of the golf team to replace Coach Weis. Her teams were big 12 Champion 6 times ( 1993, 1994, 1995, 1996, 1997,2004,) and her teams finished in the top 10 nationally 10 times. Susan Watkins inherits some great players from Pat Weis. Susan was and assistant under Weis in 1981 and 1982. This team finishes 2nd in three tournaments . Horns also finish 2nd in the Golf World Collegiate tournament. Nadine Cash, Lisa Balch , Nicole Cooper and Angela Wray all place high in tournament play during the year. Nadine Ash finished in tie for 6th place in the NCAA individual rankings in 1993 and 1994. Nicole Cooper was Conference player of the Year in 1993 and 1994. Women’s golf is on a role winning 9 out of the last 10 SWC championships. Ash, Cooper, Angela Wray and Kori Johns are all conference . 1996-Coach Susan Watkins Team claims victory in two tournaments including the SWC championship and placed 3rd in the NCAA Championship. Heather Bowie finished as #1 NCAA National Championship medalist in 1997 and was the Honda Broderik Award for National Collegiate Golfer of the year. She also finished #1 in the NCAA individual rankings in 1997. Kelli Kuehne finished tied for 10th in the NCAA individual rankings in 1996 and was an All American. – Texas Women's Golf alum Kelli Kuehne (1995-96) was selected to the Texas Golf Hall of Fame, the organization announced this week. At Texas, Kuehne won the 1995 Rolex Fall Preview, the 1996 Southwest Conference individual championship, and tied for 10th at the NCAA Championship to earn All-America status. Kuehne, honored in the amateur player category, won the 1994 U.S. Girls' Junior, the U.S. Women's Amateur in 1995 and 1996, the British Ladies Amateur in 1996, and played on the 1996 Curtis Cup team before joining the LPGA Tour. On May 30, 1999, Kuehne won the LPGA Corning Classic. Team was the Big 12 Champions. Laura Blessey finished 23rd at the 1998 NCAA Championship. Kristin Dufour finished in 6th place in the NCAA individual rankings in 1999. The 2000 team placed 3rd in the NCAA Championship and won one tournament. The golf team was victorious in one tournament, and placed 2nd in the NCAA Championship tournament. Team placed 3rd in the NCAA Championship. Winners of two tournaments including the Big 12 Championship and placed 6th in the NCAA Championship. Janice finished as 18th, 10th, 6th, and 22nd at the NCAA National Championships in 2001, 2002, 2003, and 2004s. She finished tied for 6th in the NCAA individual rankings in 2003 and tied for 10th in 2002. 2005 Perry Swenson was Academic MVP. 2007 golf team placed 17th in the NCAA Championship. The Short game practice area is dedicated to Coach Weis at the University of Texas Golf Club. Team is Victorious in the Big 12. Team placed 13th in the NCAA Championship and Nicole Vandermade was the winner in the 2011 Betsy Rawls Longhorn Invitational. Golf at Texas is heavily influence by Kate Golden. In 1985- 1989 she is a leader of one of the best teams in Longhorn golf history, she is involved in the Weis Cup tournament. From 2005- 2007 she was on the LPGA Player Executive Committee.